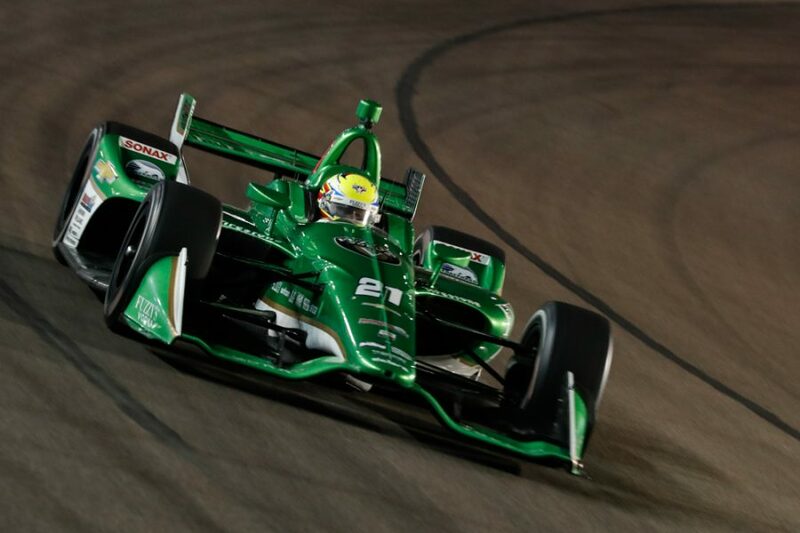 – Despite challenging conditions, Spencer Pigot persevered throughout the long Phoenix Grand Prix Saturday night in his very first race at ISM Raceway. The one-mile oval outside of Phoenix was a new track for Pigot and marked his first short oval race in an Indy car. Pigot finished the 250-lap race in the 14th position. – The starting field for the Phoenix Grand Prix was set by the average time of each driver’s two-lap run. In a new rule for 2018, qualification order for oval events is set in reverse order of entrant points. With the only race thus far being the season-opening Firestone Grand Prix of St. Petersburg, Pigot was the eighth qualifier. Pigot’s average speed was nearly five miles an hour faster than his best lap in practice, with his two-lap average fo 182.015 miles per hour giving him the 15th starting position. – The Phoenix Grand Prix got off to a clean start, with the field of 23 cars falling into line around the one-mile oval of ISM Raceway. The USAC Silver Crown series had held a race just prior to the Indy car event, leaving a tire compound on the track not immediately compatible to the Firestone Firehawks used in the Verizon IndyCar Series. Pigot settled into the 20th position, struggling with grip until the midway point of their first runs until enough Firestone rubber had been laid down on the track surface. – With the leader only two cars behind, Pigot caught a lucky break with the first yellow on Lap 41 and remained on the lead lap. He made his first pit stop with the rest of the field on Lap 43, with the No. 21 Fuzzy’s Vodka crew gaining him two spots to run 18th. – The restart on Lap 50 started an extended period of green flag running as it remained green through Lap 228. Pigot remained on the lead lap until his second pit stop on Lap 116, then fell one lap behind the leaders. He was keeping pace with cars running first, second and third when they began to make their way through lapped traffic. On Lap 140, he got up into the marbles and a stream of cars was able to get around him over the ensuing laps, including one for position, dropping him to 17th. He maintained that position until the second and final caution flag of the race flew on Lap 229. – Pigot used the yellow to pit for a fresh set of Firestone Firehawks for the final laps of the race. At the restart on Lap 243, Pigot was 15th and with two laps to go, Pigot was able to pass Gabby Chaves for the 14th position. – Ed Carpenter Racing will stay on the West Coast, moving to California early next week for the Toyota Grand Prix of Long Beach. The third round of the Verizon IndyCar Series will be broadcast live on NBC Sports Network on Sunday, April 15 at 4:30 p.m. ET.